I made this quilt for my daughter. I started it in Oak Island, North Carolina and finished in Sherwood Park, Alberta, Canada. Darlene, your quilt is simply beautiful. The fabric pull is just stunning. Your daughter is a lucky girl! 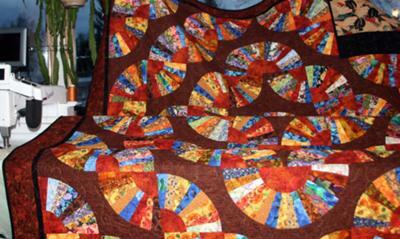 To our readers, Darlene's quilt is made from Grandmother's Fan quilt blocks that have 8 blades. 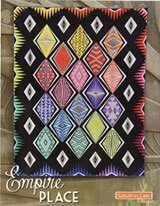 I've taken the liberty of putting this single block pattern into Electric Quilt. Flipped and rotated the blocks to illustrate the final layout shown just below. 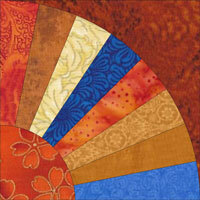 One traditional quilt block plus a complimentary color palette equals one stunning quilt! 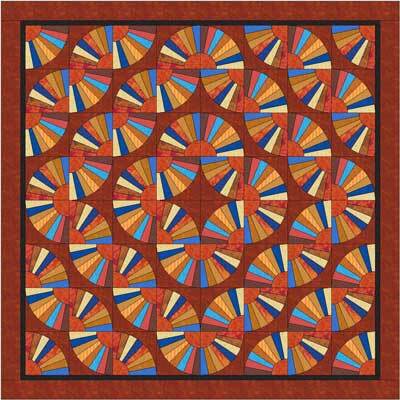 Again, Darlene, just a beautiful quilt. 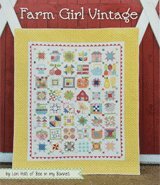 Do you happen to have a paper piecing pattern for the Grandmother's fan block? 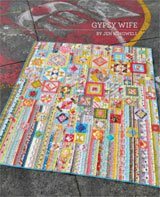 From the Editor: Hi Merrilee! At present I do not have one on the site; however, this is the second request here. Remember that while you can paperpiece the 'blades' of the fan, the corner quarter circle will need to be appliqued—either by hand or by machine. Just reply to this comment to let me know. I am looking for a foundation paper piecing of this block. 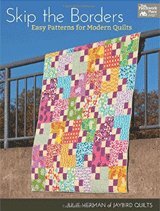 I have a quilt made circa 1890's made by great grandmother and wish to duplicate it using reproduction fabrics. 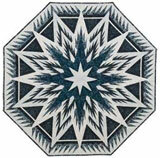 I have found lots of pictures and I have the templates, but I would love to make it via foundation paper piecing. From the Editor: Hi Sally! Yours is the first of two requests for this. (See my response to the above inquiry.) What size are you looking for? Reply to this comment to let me know.